The Public Lighting Systems and Associated Equipment NVQ 2356 Level 3 consists of eight units, 301 to 304 & 315 to 318, and each unit needs to be complete over three separate occasions. This unit is for: You if you are preparing to carry out works on public lighting systems and associated equipment. This unit is about: Ensuring that the public lighting systems and associated equipment are appropriate for the work site and working conditions. • carry out the correct procedures with regard to identifying the means of supply and site service cables. This unit is for: You if you are required to install and connect public lighting systems, components and associated equipment. This unit is about: Following the correct procedures for the installation and connection of public lighting systems, components and associated equipment. • connect public lighting systems and associated equipment and check the connections using safe methods. This unit is for: You if you are required to inspect and test public lighting systems and associated equipment. This unit is about: Carry out the process of inspecting and testing public lighting systems and associated equipment in a safe manner and in the correct sequence to ensure that the installation complies with the client’s requirements and the industry codes of practice. This unit is about: Ensuring that safe and approved methods are used to carry out emergency work on public lighting and associated electrical equipment. 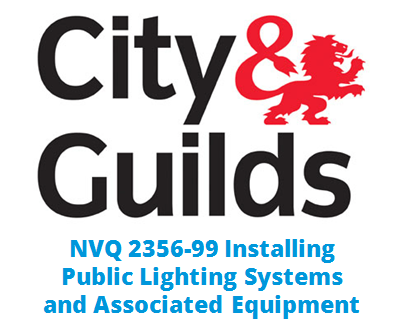 Start Your NVQ 2356 Level 3 in Public Lighting Systems NOW!